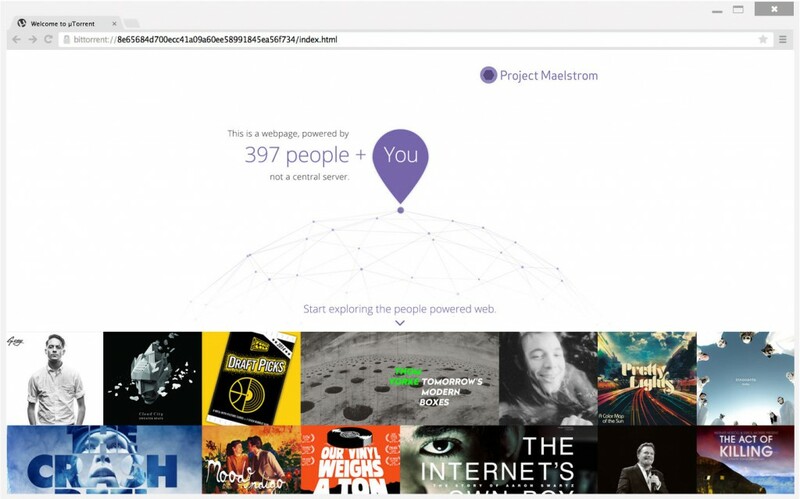 BitTorrent Inc, the company behind the popular file-sharing client uTorrent, hopes to start a new revolution with its people-powered browser Maelstrom. Now that the first Beta has been released to the public ,developers can come up with interesting use cases, such as censorship free websites. San Francisco-based BitTorrent Inc. already has a few popular applications in its catalog, including uTorrent and Sync. However, with its new “people-powered” browser it hopes to spark another revolution. Project Maelstrom, as it’s called, is still in the early stages of development but the company has decided to push a Beta out to the public so developers can start building tools and services around it. In short, Maelstrom takes Google’s Chromium framework and stuffs a powerful BitTorrent engine under the hood, meaning that torrents can be played directly from the browser. More excitingly, however, Maelstrom also supports torrent-powered websites that no longer have to rely on central servers. By simply publishing a website in a torrent format the website will be accessible if others are sharing it. This can be assisted by web-seeds but also completely peer-to-peer. For example, earlier this week Wikileaks published a controversial archive of documents and emails that leaked after the Sony hack. If the hosting provider was forced to take the files down they would disappear but with Maelstrom-supported sites, users would be able to keep it online. The same is true for torrent sites such as The Pirate Bay, which suffered weeks of downtime recently after the site’s servers were raided. At the moment there are very few websites that support Maelstrom. There is an early WordPress plugin and others are experimenting with it as well, but wider adoption will need some time. That said, traditional magnet links work too, so people can play video and audio from regular torrent sites directly in the browser. BitTorrent Inc. informs TF that the main goal is to provide a new and open publishing platform. It’s now up to developers to use it to their advantage. “We believe in providing an alternative means for publishing that is neutral and that gives ownership back to those publishers. But one of our biggest goals with this release is just to get it out and into the hands of developers and see what emerges,” Maelstrom’s project lead Rob Velasquez says. And in that respect momentum is building. BitTorrent Inc. says that a community of more than 10,000 developers and 3,500 publishers has already been established, with tools to bring more on board now available via Github. While Maelstrom can bypass Internet censors, it’s good to keep in mind that all shared files are visible to the public. Maelstrom is caching accessed content to keep it seeded, so using a VPN might not be a bad idea. After all, users leave a trail of their browsing history behind. On the upside, Maelstrom can be more private for publishers as they don’t have to share any personal details with hosting companies or domain registrars. “The BitTorrent protocol remains the same, but it does mean that you no longer have to hand over personal, private data to domain registrars or hosting companies to put up a simple website,” Velasquez notes. The idea for a BitTorrent-powered browser is not new. The Pirate Bay started work on a related project last year with the aim of keeping the site online even if its servers were raided. It will be interesting to see if Maelstrom can get some traction. There’s still a long way to go, but the idea of an open and censorship-free web does sound appealing. With a Mac version still under a development, Project Maelstrom (beta) can be downloaded for Windows here.